We were getting in a rut of eating toast and eggs for breakfast. Don’t get me wrong I love toast and eggs (especially because we get local fresh eggs from a dedicated amazing 12 year old egg farmer!). To change things up a bit, I recently purchased some granola from Farm Boy – a small little package on sale for $4.99. $4.99 is better than $5.99 but that is still really quite expensive when you think about what it in the store-bought stuff…a few cranberries, tiny tiny slivers of almonds (maybe 2 tbsp!) and a whole lot of oats and brown rice syrup (the first two ingredients listed on the back of the package). I actually really enjoy making my own granola but just haven’t done so in awhile. You get to put whatever you feel like in it and you can control the sweetness. This time I used what I had in the pantry and I loved the combo – apricots and almonds (and I had to use up about 10 pecans so if you’re eyeing my pictures carefully that’s the other nut you see!). The apricots are super dark because I bought the unsulfured kind. They are actually really soft, sweet and really delicious. Homemade granola is a great snack on its own, over yogurt, or can act as cereal with any kind of milk (2%, almond, soy, etc). You can play around with the ratios a bit but you need the fat (I used coconut oil but you could use melted butter) and you need some liquid sweetness (like honey or maple syrup) so that your granola forms some clusters. I like loading mine with mostly nuts and fruit, unlike the packaged stuff which is mostly oats. It’s definitely a better bang for your buck, and super easy and quick to make. It stores really well for at least 2 weeks in an airtight container (and even longer if you have it in the fridge). It’s also a much more guilt-less snack when you’re craving something to munch on later in the evening once the kiddos are in bed! Preheat oven to 350 F and line cookie sheet with parchment paper. Place almonds in a large ziplock bag and roughly crush them with a rolling pin. Place almonds and oats in a large bowl. Add cinnamon, salt, honey and melted coconut oil. Stir to coat and mix evenly. Spread mixture out on parchment lined cookie sheet and bake for about 10-15 minutes – carefully stirring once halfway into cooking time – until golden brown (I have a convection oven which bakes faster). While almonds are baking roughly chop apricots into small pieces. Remove from oven and allow to cool – combine apricots and almond mixture, & enjoy! Sometimes, a good stack of pancakes just hits the spot. A big favourite in our house is cottage cheese pancakes, which we make all the time, even on weekdays because they are so quick and easy (and healthier). But on the weekends we’ve been experimenting a bit with a more traditional style (fluffy & light) and these ones have been tested on friends and our kids many times. One thing that’s cool about them is that you can have your kids mix it – it doesn’t need to be perfect, in fact over mixed pancake batter makes them dense. They are relatively easy to make and most likely you will have the ingredients in your pantry. You could even measure out the dry ingredients and multiply it a few times to create your own pancake mix (don’t buy the boxed stuff!) and just add the wet ingredients whenever you want pancakes! Combine milk and vinegar, stir, and let it sit while you prep the rest of the ingredients. Combine dry ingredients and whisk to combine. In a large bowl, whisk eggs with vanilla, beating until a little bit frothy/more volume (about 2-3 minutes, doesn’t have to be exact). Add milk mixture – whisk lightly to combine. Add dry ingredients and whisk a few times, just to get rid of big lumps of flour. Do not over mix! Let the batter sit for at least 5 minutes, so that the baking powder does it’s work. In a non stick pan or griddle on medium heat, add butter for frying (about 1 tsp per batch or so). Ladle batter into buttered pan to cook pancakes, as big as you wish. Top with some blueberries (about 1 tbsp or so per pancake). Once the edges slightly change in colour and there are bubbles on top, it should be ready to flip. Flip and cook until the other side is golden brown as well. Enjoy! love a runny egg over anything! Over Easter we were incredibly lucky to have spent the weekend in California’s Disneyland with my parents! What a treat it was for all of us – literally in every sense. Though it’s fun to eat out and enjoy things like decadent pastries for breakfast, we all came home feeling like we needed more greens and veggies. This week I am challenging myself to eat more greens (to make up for my lack of consuming them in Disneyland!) and it seemed fitting to start the day right. Sometimes it seems weird to have your coffee alongside veggies but this morning I actually quite enjoyed my sautéed kale with a runny egg on top, instead of a piece of toast and fried egg. Super filling, easy, nutritious, and very yummy. Feel like your morning is too rushed to prep a breakfast like this? Plan ahead and make sure you wash and tear up your kale the night before so it’s ready to go in the morning! In a nonstick pan, add 1 tsp oil on medium heat. Add kale and season lightly with salt and pepper – cover with a lid for 1 minute – just so it steams and softens. Remove lid and toss/stir, to cook all edges of the kale. Load up your kale onto a plate – then fry up an egg any style you like (my favourite is over easy…love the creamy yolk) – ENJOY! This is becoming my favourite breakfast! Super quick and easy, packed with nutrients and hearty enough to get you through your morning but not so heavy it makes you tired. 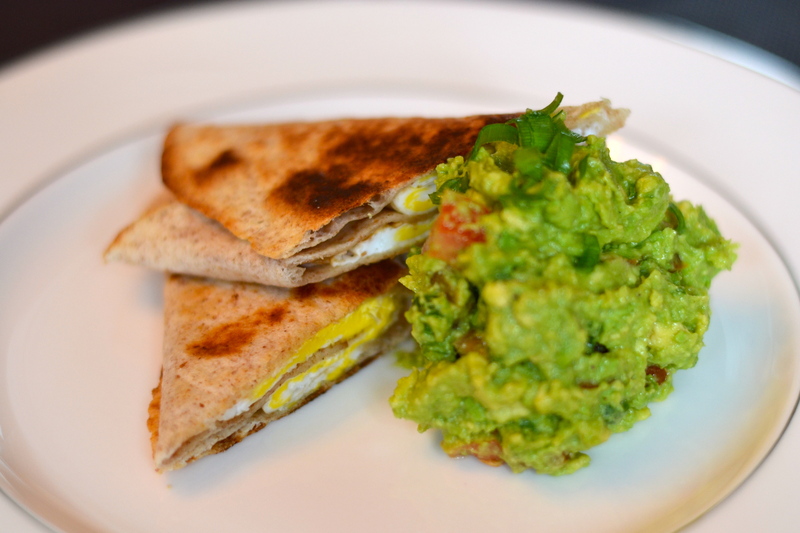 It’s also a fun one for your kids because they get to scoop and dip their crispy egg quesadilla into creamy avocado goodness. Yum! Cut avocado, remove pit, and scoop out flesh and roughly mash in a bowl. Wash and dice up tomato, add it to avocado and mix gently. Add green onions, lemon juice and a small dash of salt and pepper and mix. Set aside. In a non-stick pan on medium heat, melt about 1/2 tsp butter. Crack an egg into it, and roughly break yolk with spatula to quicken the cooking process. Sprinkle a tiny bit of salt and pepper on the egg. Place 1 tortilla flat on top of the egg. Once you can get under the egg with the spatula easily (or, it wiggles in the pan if you hold the handle and shake it a bit) – go ahead and flip it over. The egg should be now on top of your tortilla. Cook for another minute or so, to crisp up the tortilla. Fold the tortilla over three times and flatten with spatula to keep it’s shape. Transfer to plate, and serve with a big scoop of avocado on the side. Repeat sets 1 – 4 for another serving. Enjoy!